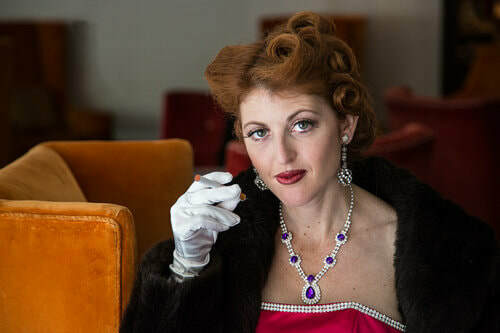 Bette Davis Ain't for Sissies, written by and starring Jessica Sherr, is a 90-minute one-woman show about the 1930's icon, Bette Davis, on the night of the 1939 Academy Awards. Miss Davis is nominated for Best Actress in Dark Victory, and the Los Angeles Times-LEAKED the Oscar winners EARLY...the BOLD, DEFIANT and DISILLUSIONED, Bette Davis decides to leave the Oscars! Bette Davis Ain't for Sissies is an up close and personal conversation with the two-time Oscar winning and ten-tim Oscar nominated actress, Bette Davis. Embodying the screen heroine is actress and playwright, Jessica Sherr, the image of a young Bette, who brings u into the 60-year history of "The First Lady of the American Screen." Back in her Hollywood home, Jessica Sherr, powerfully channels Ms. Davis fuming and frustrated, she takes us on a bumpy ride that portrays a tumultuous entry into the Silver Screen. In these private moments we get a look at the vulnerable and injured side of the great star, imprisoned by her own ambition, who may often be knocked down, but will not stay down and complain like a sissy. Witness Bette's most defining moments as a tenacious starlet fighting her way to the top!! See what happens when someone who always wins...loses.